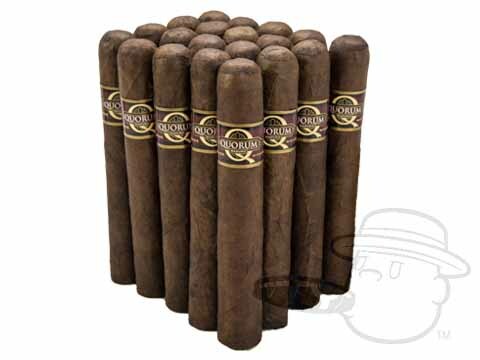 Quorum Double Gordo Maduro is a medium bodied smoke with smooth tones of cocoa, cedar, and more in a fat and flavorful 6x60 Double Gordo vitola. I'm no connoisseur. I'm new to cigars but this was awful. Terrible burn. Couldn't keep lit and the taste was bad. I can't finish the rest. The bonus pack however was good. I like a full flavored cigar. This is one of the best I have hound that is affordable as an every day smoke. I have yet to get one rolled too tight which drives me nuts. My only complaint is that is seems to burn a bit fast. I would say I get through it in an hour and a half if I am smoking it enough where it doesn't go out. Great walking around smoke. Can't get better for the price! Excellent smoke at a low price. High end everyday cigar. love this cigar great for the price point. This is a good solid value priced cigar. It's not what I celebrate with but my daily smoke. They had a great flavor but some were rolled a bit too tight. Quorum Double Gordo Maduro is rated 4.1 out of 5 based on 21 customer ratings.